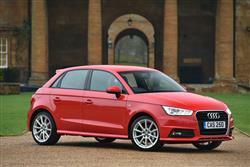 Audi's five-door A1 Sportback has been given a freshening for this season. Jonathan Crouch runs the rule over the updates. You might love the looks of Audi's cute A1, but when it comes to laying cash on the table, the extra £620 Audi charges for the bigger A1 Sportback five-door looks money well spent. It gets the entry-level option of a 1.0-litre turbo petrol engine like its three-door sibling, some styling and equipment tweaks and a ballistic S1 version to head up the range. Every once in a while, a car manufacturer launches a vehicle that unexpectedly takes off. The Audi A1 Sportback is just such an example. Okay, so Audi has been trying to fill so many micro-niches for so long that it was bound to hit upon something that resonated with UK buyers, but that's another discussion for another time. The A1 Sportback instantly appealed to those who liked the dinky three-door A1 but couldn't make a car quite that small fit into their lives. People with kids in other words. Where the A1 was clever was in recognising that just because people wanted a small car, it didn't mean that they couldn't afford a bigger one. They just wanted something manageably-sized with all of the luxury and refinement of a larger car for use in cities. The A1 Sportback delivered all of that and rear seats you could use without putting your back out. It's now been revised and looks set to continue its predecessor's purple patch. The big news for the latest A1 Sportback is the introduction of a tiny 1.0-litre three cylinder engine, their triple developing a punchy 95PS, which replaces the unexciting 89PS 1.2-litre TFSI that used to prop up the range. Otherwise, you get to choose from two versions of the turbocharged 1.4-litre TFSI - the 'standard' unit with power up from 122PS to 125PS and the 'Cylinder-on-Demand' alternative now offering 150PS. Diesel customers are served by a 1.6-litre TDI. Depending on version, all engines will be linked to either a five-speed or six-speed manual transmission as standard, and, for the first time, all (including the 1.6 TDI) will also be available with the option of a seven-speed S tronic twin-clutch automatic transmission. Audi has upgraded the steering in the latest A1, the electromechanical system delivering a more faithful level of speed-sensitive assistance. Both the steering and the optional suspension with adjustable damping are controllable via the Audi drive select adaptive dynamics system, which is now a standard feature for A1 Sport models upwards. It allows the driver to vary the weighting or the damping characteristics across three modes - auto, dynamic and efficiency - and it can also adjust the operating parameters of the engine and the S tronic transmission, where this is fitted. There's also a new suspension option including adjustable dampers available for Sport models and above. At the top of the range sits the ballistic 231PS S1 quattro, which will dust off the sprint to 62mph in just 5.9 seconds. Although the silhouette isn't quite as pure as that of the three-door A1, this Sportback model is still handsome and the latest styling updates don't really alter that fact. There's a flatter and wider singleframe grille, revised bumpers, different standard alloy wheel designs and an updated colour palette. The Sportback measures six millimetres taller and six millimetres wider, and inside offers a smidgeon more head and shoulder room as a result. It also makes provision for a third passenger in the back, although it's a squeeze for adults. Luggage capacity is on a par with the three-door A1, at 270-litres with the backrests of the standard split/folding rear seat in place - or 920-litres with the seat folded. The retractable head restraints don't have to be removed to do this. The loading lip is a comfortably low 66cms and stowage can be further simplified by an optional luggage package which features divided storage compartments under the loading floor to prevent your bottles of Coke scrambling your eggs on the way home. The cabin is quiet and maturely finished with no speedometers the size of dinner plates or garish graphics. Audi contend that if you're downsizing from a bigger car, you expect big car sophistication and the A1 serves that up in spades. Everything is soft touch, silicon-damped and consistent in feel and design. There's now additional chrome and high gloss black detailing, new upholstery choices including an Alcantara and leather blend and new upholstery colours, such as Laser blue for Sport models and Rotor grey for S line models, which until now have had an exclusively black finish. The A1 Sportback adds £620 to the price of the three-door car, which seems sterling value for money by comparison. This means that you'll pay from around £15,000 for the 1.0 TFSI in SE trim. Standard equipment includes alloy wheels, remote central locking, air conditioning, electric front windows and mirrors and a six-speaker single CD audio system with auxiliary iPod connection linked to a 6.5-inch retractable display. A secondary collision brake assist system also now joins this list for the latest range, which can initiate automatic braking to reduce the risks of skidding and additional collisions during an accident. From there, buyers can step up to Sport trim - or S line-spec at the top of the range. The S tronic twin-clutch transmission might seem an expensive toy for just over £1,500 more, but once you've sampled it - especially in a car built for cities - you really won't want to revert to a manual. Audi has concentrated on improving the efficiency in this A1 Sportback, and nowhere is that more clearly demonstrated than in the replacement of the 1.2 TFSI with the 1.0 TFSI engine. The newer three-pot engine is capable of returning at least 60mpg with CO2 emissions of 99g/km, which easily betters the old engine's 118g/km and 55mpg showing. The 1.4-litre TFSI petrol engines don't do too badly either, with the standard 125PS unit emitting 115g/km and that clever Cylinder-on-Demand technology shaving that number down to 112g/km, despite packing 150PS. The 1.6 TDI retains its place as the efficiency trailblazer in the range, with CO2 output in this latest version reduced from 99g/km to 92g/km and economy potential increased from 74.3mpg to up to 80.7mpg. Even the boisterous S1 Sportback gets some very respectable figures for such a quick car. A combined mpg figure of 39.8mpg isn't what you expect from a petrol-powered sports saloon that can seat five and still knock off 62mph in less than 6 seconds. The evolutionary styling of this mildly facelifted model isn't going to send residuals of older A1s into a flatspin either, which will come as some relief if you're an existing owner, and should help protect the value of your trade in if you fancied chopping it in against a new version. In truth, Audi didn't need to do a lot to the A1 Sportback. It was pretty peachy as it stood. In fact, Ingolstadt needed to walk a tightrope here. They needed to be seen to be doing something but not anything that would radically alter what was clearly a winning formula. As it stands, there have been a few trim changes that will put a smile on the dial of a new buyer, but the biggest change is the introduction of the three-cylinder 1.0-litre powerplant to replace the 1.2-litre unit. That 1.2 would have been a worthy engine for most other supermini makers but if you're going to charge premium prices, you need to deliver premium engineering. Vorsprung durch technik and all that. Downsizing is all about buying a smaller car but without having to be constantly reminded of it with an uncomfortable ride, practicality compromises and a lack of creature comforts. The A1 might command a hefty asking price but most owners aren't complaining about the value it delivers. That doesn't look like changing.